Galilean School of Higher Education: Applications open. category: Astronomy Education Comments Off on Galilean School of Higher Education: Applications open. The Galileian School of Higher Education is the possibility for some excellent students, selected by admission tests, to live in a very stimulating contest. Tutors, seminars, special internal courses, cultural exchanges, computer facilities should promote their personal and cultural better formation. The goal is to allow, following the example of Galileo, an integrated learning method in order to form a highly qualified international group. 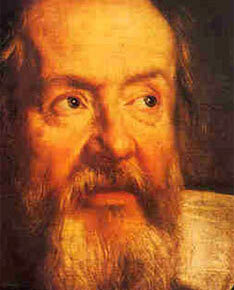 The School, is inspired by Galileo who was not only great Astronomer and mathematician, but also a fine philosopher and a man of literature, has beside a scientific group and a humanist. The location is in an old noble building in the town of Padua. Students can live there (single rooms) and all the facilities are FREE. Each year 24 students are admitted. Up to now there are only Italian students but the new actual director , prof. Cesare Barbieri, will be glad to receive also some European students. The GS has been active for 6 years but isn't spreadly known. Teachers should tell their students about this unique opportunity. Attention: The APPLICATION DEADLINE is September, 2012. 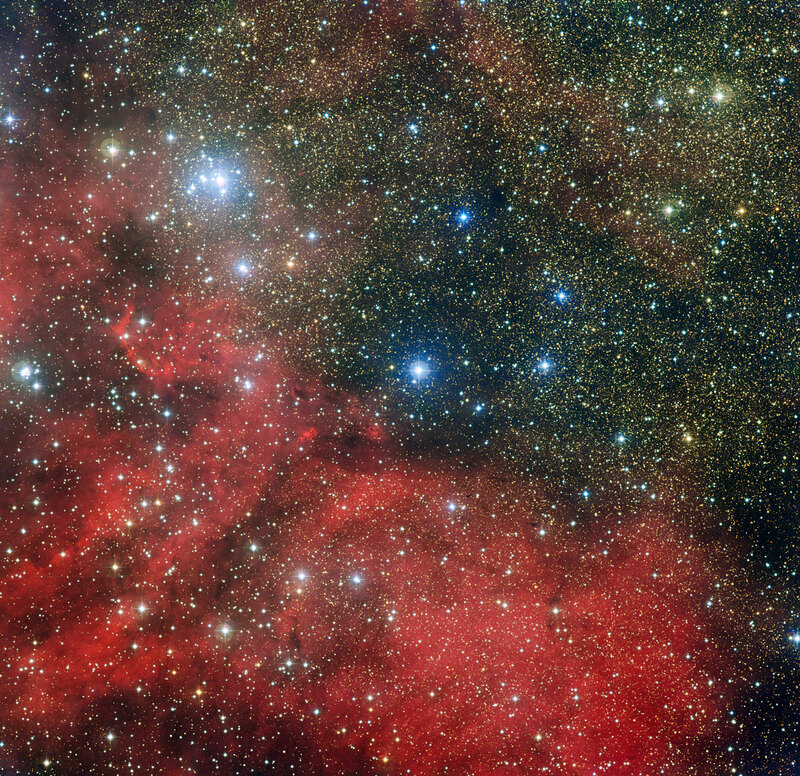 The star cluster NGC 6604 and its surroundings. 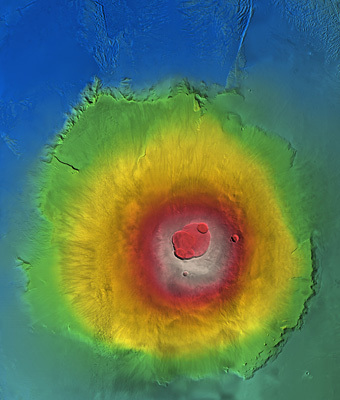 Olympus Mons colour-coded according to height from white (highest) to blue (lowest). The Sombrero galaxy is not simply a regular flat disk galaxy of stars as previously believed. While some galaxies are rotund and others are slender disks like our spiral Milky Way, new observations from NASA's Spitzer Space Telescope show that the Sombrero galaxy is both. The galaxy, which is a round, elliptical with a thin disk embedded inside, is one of the first known to exhibit characteristics of the two different types. The findings will lead to a better understanding of galaxy evolution, a topic still poorly understood. "The Sombrero is more complex than previously thought," said Dimitri Gadotti of the European Southern Observatory in Chile and lead author of a new paper on the findings appearing in the Monthly Notices of the Royal Astronomical Society. "The only way to understand all we know about this galaxy is to think of it as two galaxies, one inside the other." The Sombrero galaxy, also known as NGC 4594, is located 28 million light-years away in the constellation Virgo. From our viewpoint on Earth, we can see the thin edge of its flat disk and a central bulge of stars, making it resemble a wide-brimmed hat. Astronomers do not know whether the Sombrero's disk is shaped like a ring or a spiral, but agree it belongs to the disk class. "Spitzer is helping to unravel secrets behind an object that has been imaged thousands of times," said Sean Carey of NASA's Spitzer Science Center at the California Institute of Technology in Pasadena, Calif. "It is intriguing Spitzer can read the fossil record of events that occurred billions of years ago within this beautiful and archetypal galaxy." Spitzer captures a different view of the galaxy than visible-light telescopes. In visible views, the galaxy appears to be immersed in a glowing halo, which scientists had thought was relatively light and small. With Spitzer's infrared vision, a different view emerges. Spitzer sees old stars through the dust and reveals the halo has the right size and mass to be a giant elliptical galaxy. While it is tempting to think the giant elliptical swallowed a spiral disk, astronomers say this is highly unlikely because that process would have destroyed the disk structure. Instead, one scenario they propose is that a giant elliptical galaxy was inundated with gas more than nine billion years ago. Early in our universe, networks of gas clouds were common, and they sometimes fed growing galaxies, causing them to bulk up. The gas would have been pulled into the galaxy by gravity, falling into orbit around the center and spinning out into a flat disk. 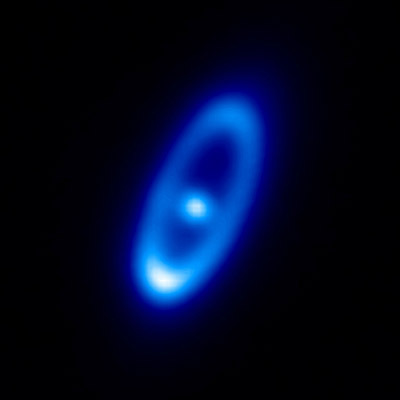 Stars would have formed from the gas in the disk. "This poses all sorts of questions," said Rubén Sánchez-Janssen from the European Southern Observatory, co-author of the study. "How did such a large disk take shape and survive inside such a massive elliptical? How unusual is such a formation process?" 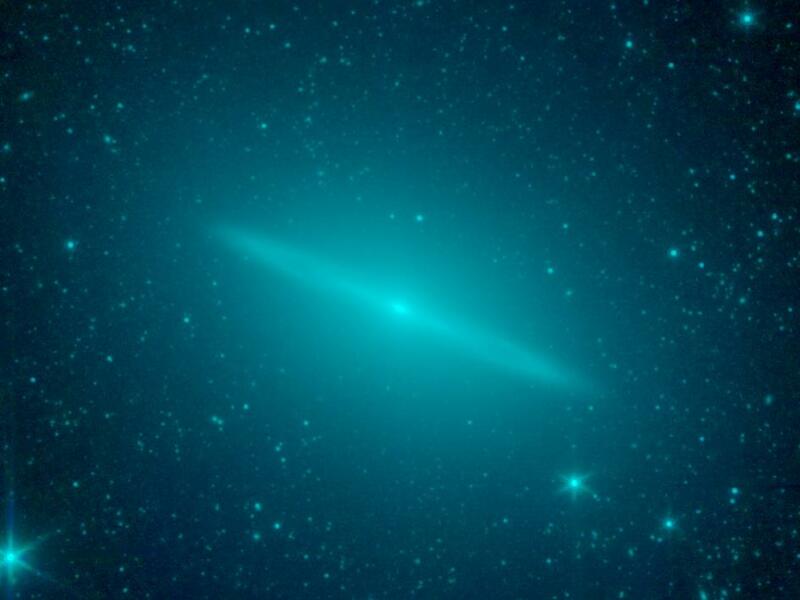 The findings also answer a mystery about the number of globular clusters in the Sombrero galaxy. Globular clusters are spherical nuggets of old stars. Ellipticals typically have a few thousand, while spirals contain a few hundred. The Sombrero has almost 2,000, a number that makes sense now but had puzzled astronomers when they thought it was only a disk galaxy. 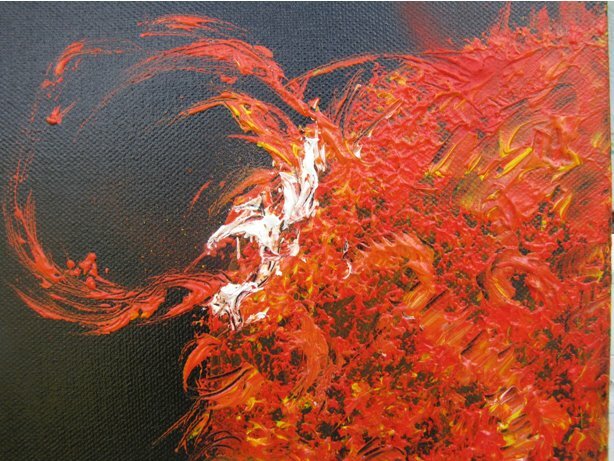 As the city gears up for Dublin: City of Science 2012, we take a journey with amateur astronomer and artist Deirdre Kelleghan whose equal passion for science and art is demonstrated in her work. Deirdre is a Discover Science and Engineering Science Ambassador 2012, Vice Chair of the Irish Federation of Astronomical Societies, National Co-ordinator for Astronomers Without Borders, as well as being UNAWE rep in Ireland. Deirdre will also be contributing to the Dublin City Public Libraries programme of events for Dublin: City of Science 2012. The city on a sun drenched day. The Spire reflects and swirls the vibrant life of Dubliners mingled with mirrored clouds and the dominant blue light from our nearest star. Flower sellers petals are jollied by the brightness. Mica within the Liffey’s walls sparkle; ice cream melts down smiling faces. Celtic skin hovers in winters long lost vitamin, a gift from the sun, 93 million miles from the city. We enjoy our sophisticated fully functioning star, down here on one of the left over bits from its formation. Image credits: NASA/CXC/UCDavis/W.Dawson et al. Image credits: ESA/Herschel/PACS/Bram Acke, KU Leuven, Belgium. The dust ring around Formalhaut. Image credits: Millimeter/submillimeter: ALMA (ESO/NAOJ/NRAO). Visible light image: the NASA/ESA Hubble Space Telescope. 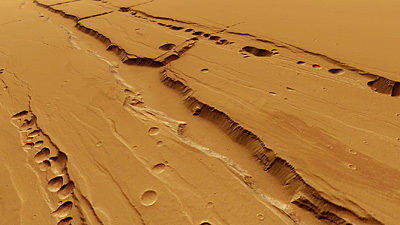 category: ESA, Mars Comments Off on The pit-chains of Mars – a possible place for life? The group attending the workshop week were collectively delighted when Professor George Miley founder of UNAWE was presented with The Order of the Lion (the Netherlands highest honour) at the official opening of the talks at the old observatory in Leiden.